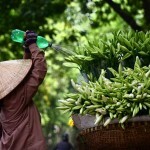 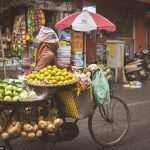 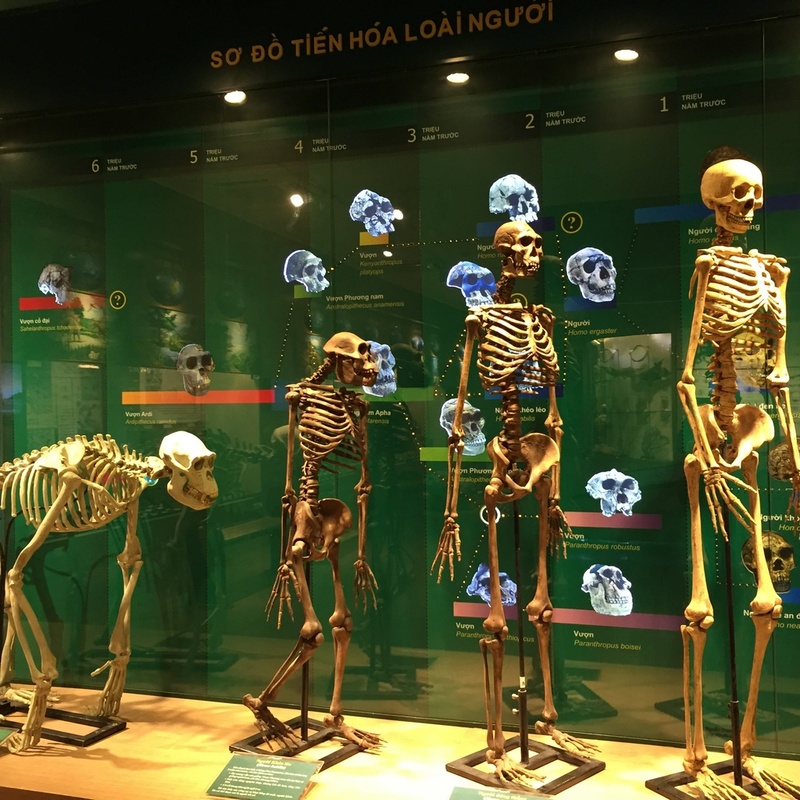 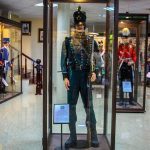 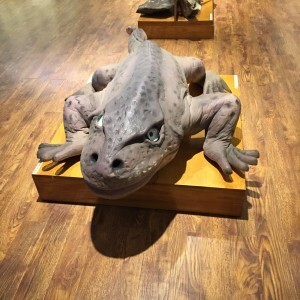 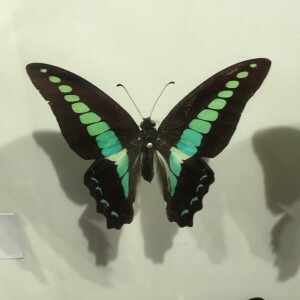 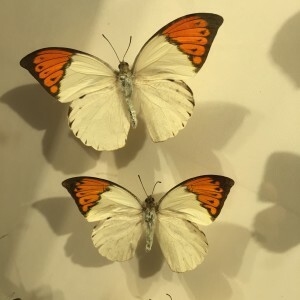 Visiting Vietnam National Museum of Nature — The first nature museum in Hanoi, Vietnam - Living + Nomads – Travel tips, Guides, News & Information! 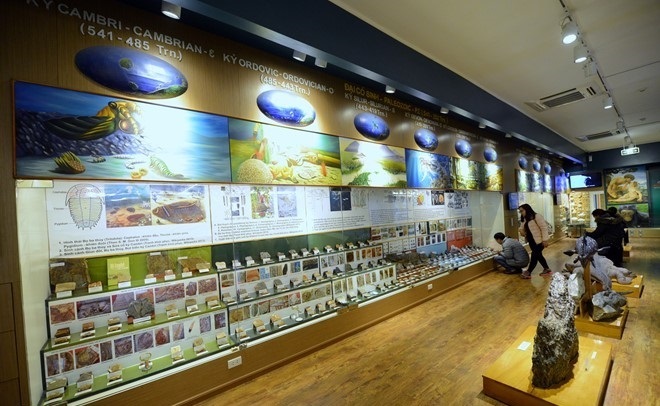 1,400 unique samples showing how the life has been formed throughout 3.6 billion years are exhibited at the Vietnam National Museum of Nature (Cau Giay, Hanoi). 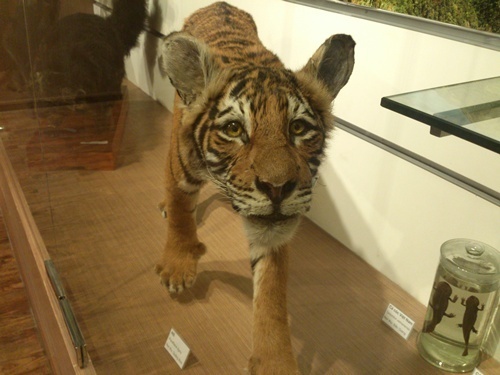 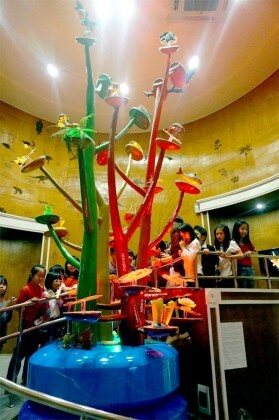 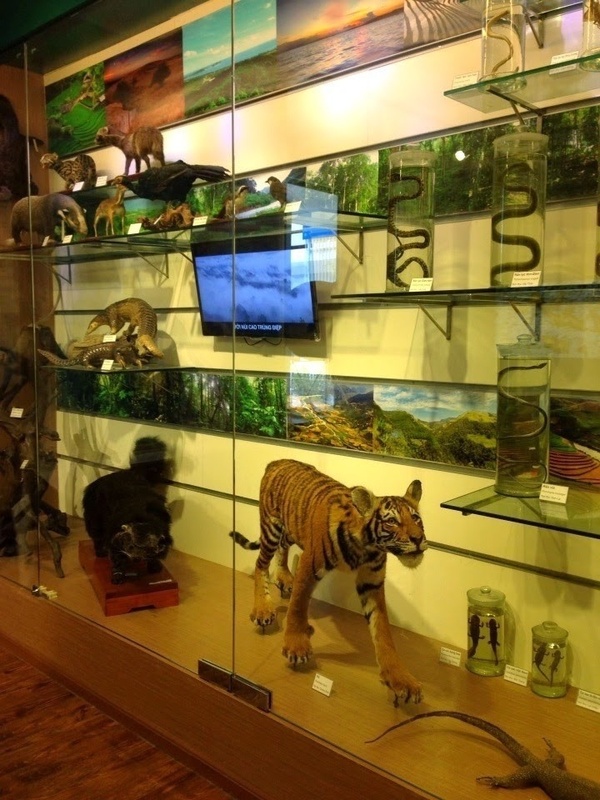 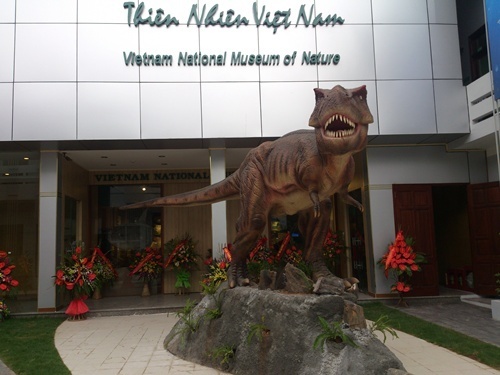 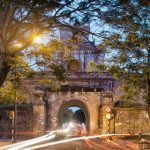 The Museum of Nature is tucked away in the campus of Vietnam Academy of Science and Technology (No. 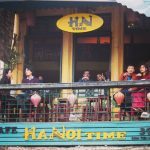 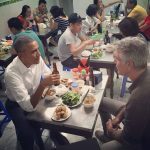 18 Hoang Quoc Viet street, Cau Giay district, Hanoi). 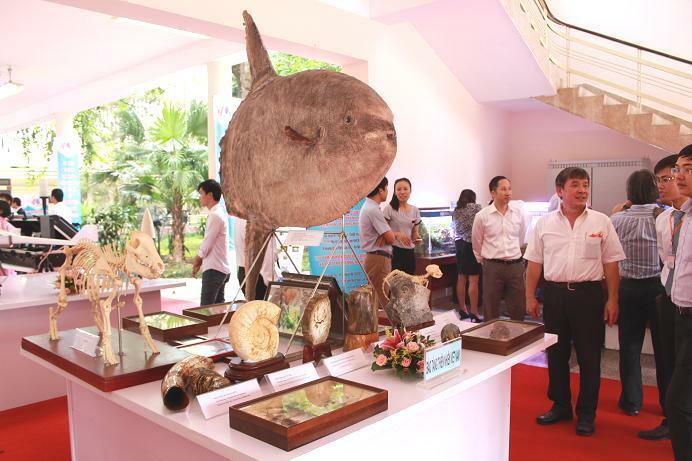 This is one of the new and modern museums in Hanoi, opening from May 15th 2014. 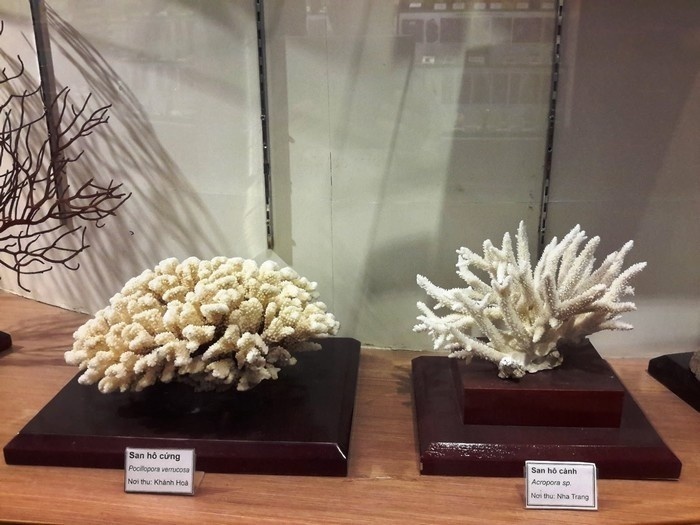 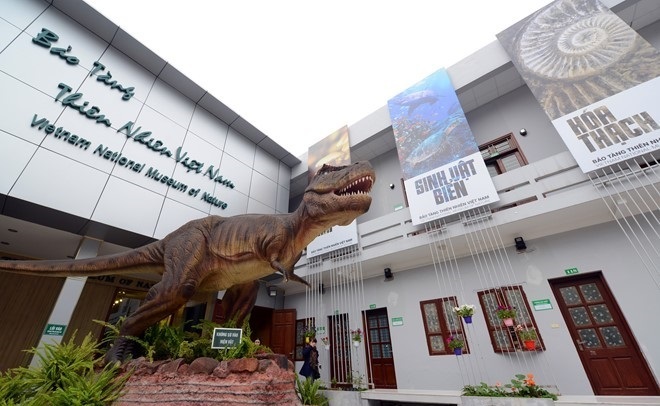 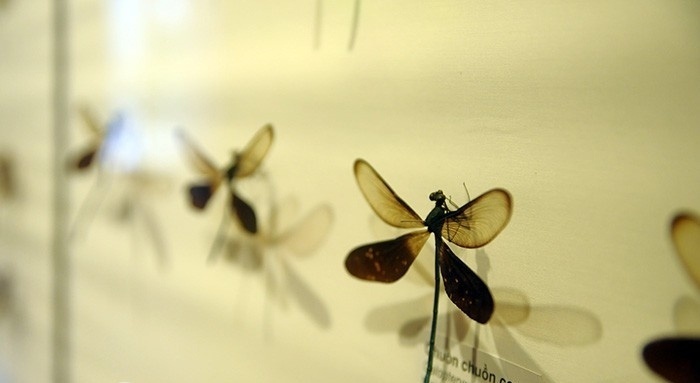 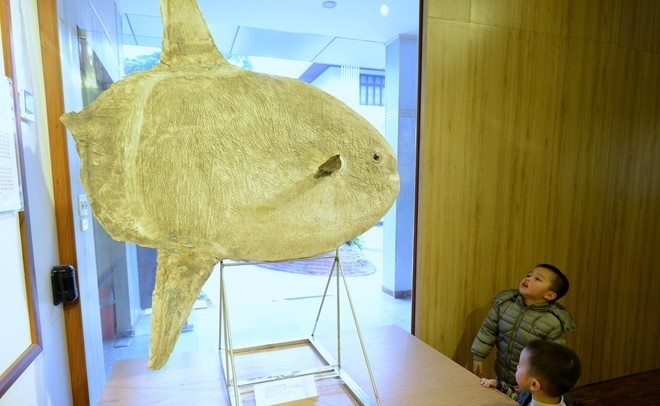 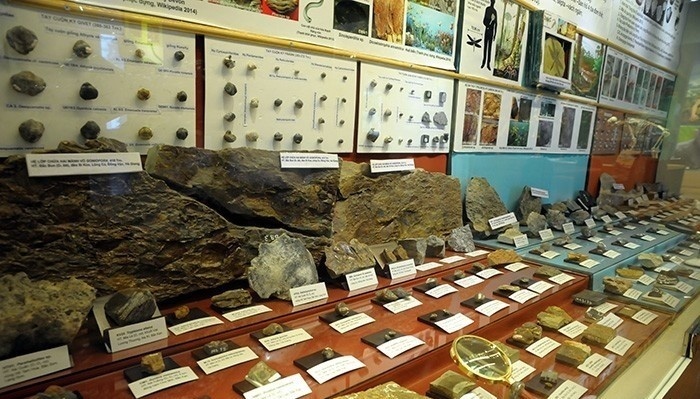 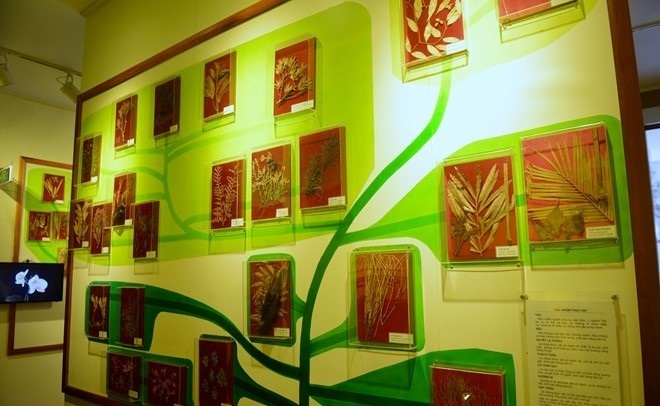 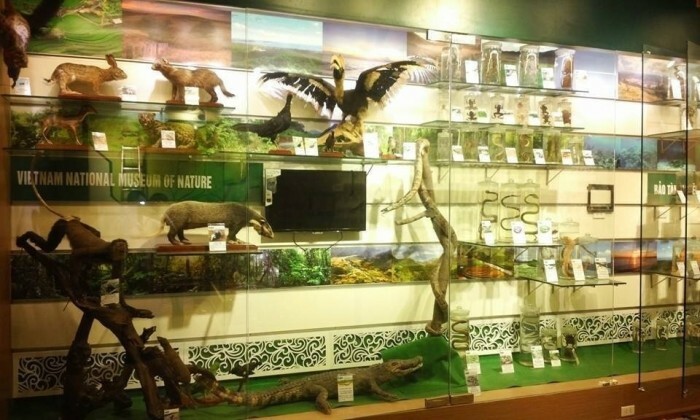 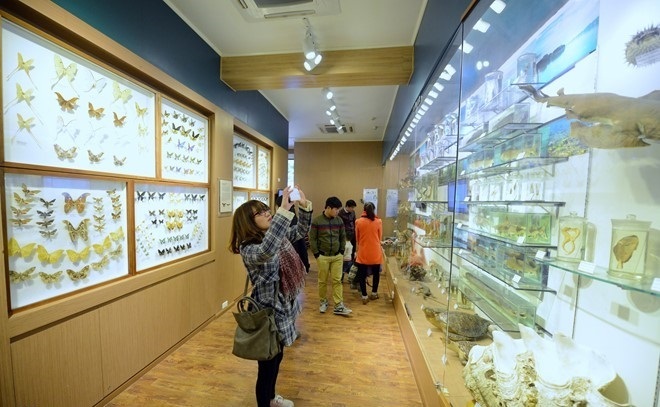 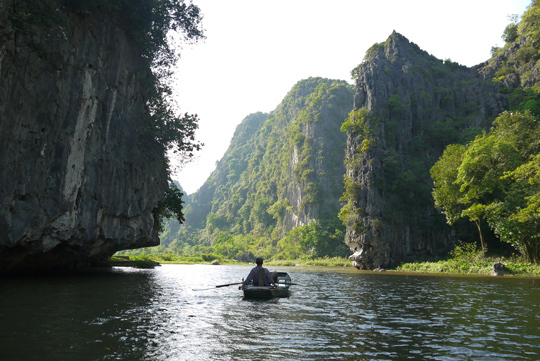 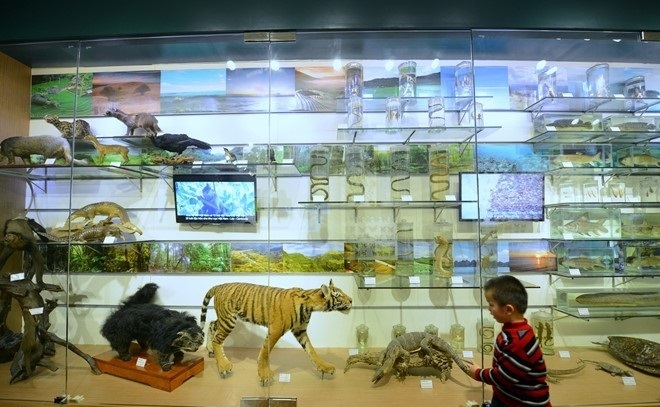 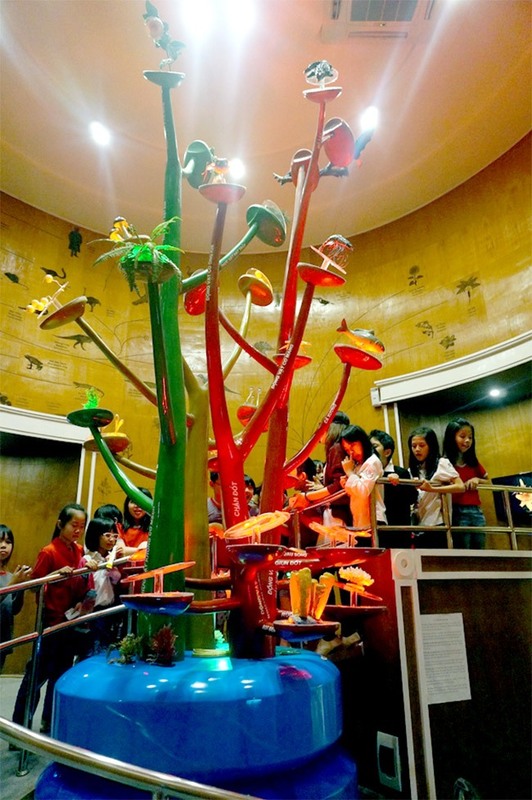 Nearly 1,400 samples are exhibited on a modest area of 300 square kilometers (the total area of the museum is over 1,000 square kilometers) and still outline the story of history throughout 3.6 billion years about the origins of life and nature in Vietnam. 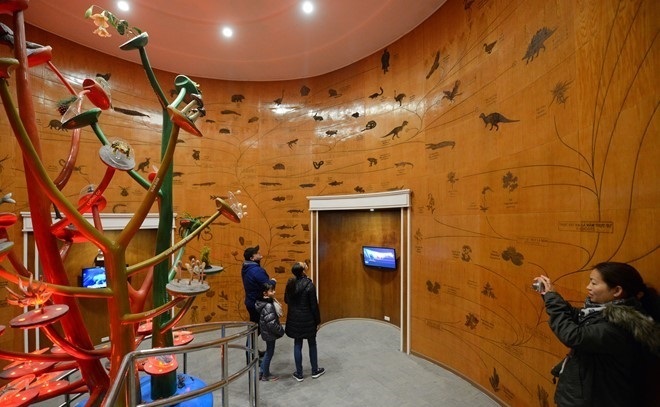 The evolutionary tree is painted in detail on the wooden wall showing the world of diverse living creatures with 5 regnums: monera, protista, fungi, plant and animal. 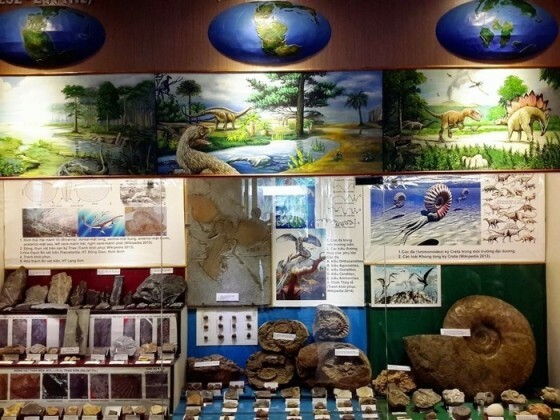 The history of life with the fossils of 4 periods of geological development: the Precambrian Time (4,500 – 541 million years ago), the Paleozoic Era (541 – 252 million years ago), the Mesozoic Era (252 – 66 million years ago) and the Cenozoic Era (66 million years ago to today). 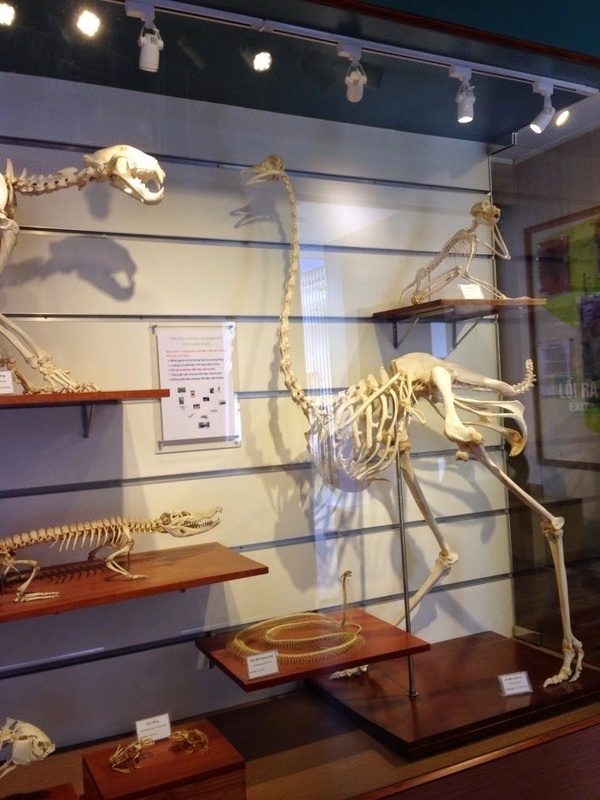 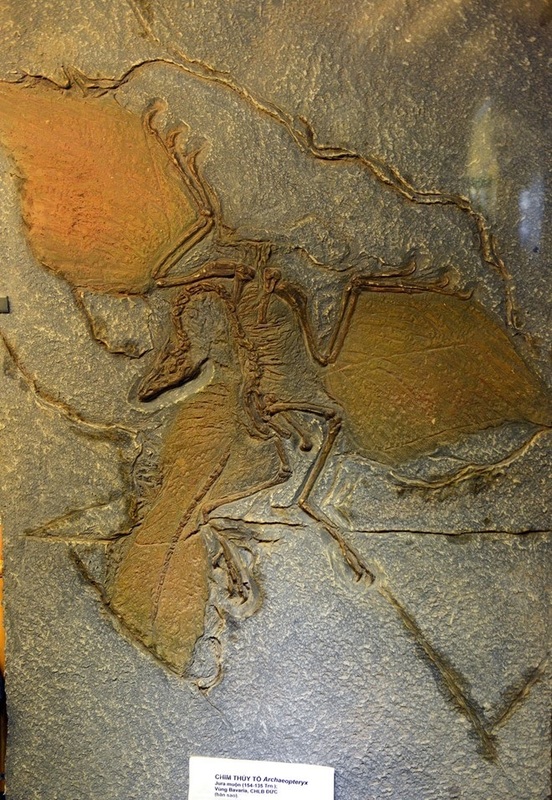 Special fossil specimens such as the Archaeopteryx (154 – 135 million years ago, found in Germany) are exhibited at the museum. 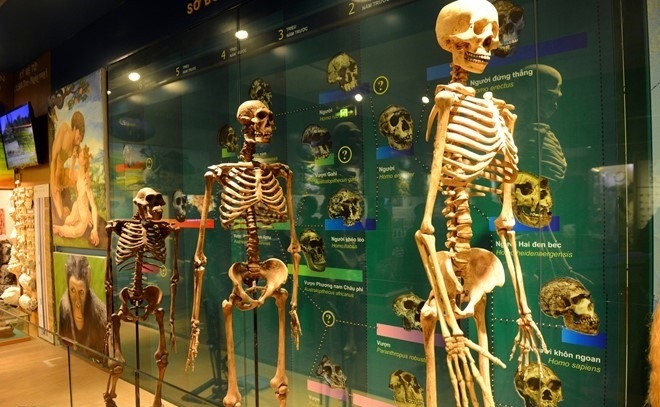 Human evolution from the primates, then different Homo species and finally Homo sapiens (the modern humans nowadays). In the above picture are the specimens of Homo habilis, Homo erectus and Homo sapiens. 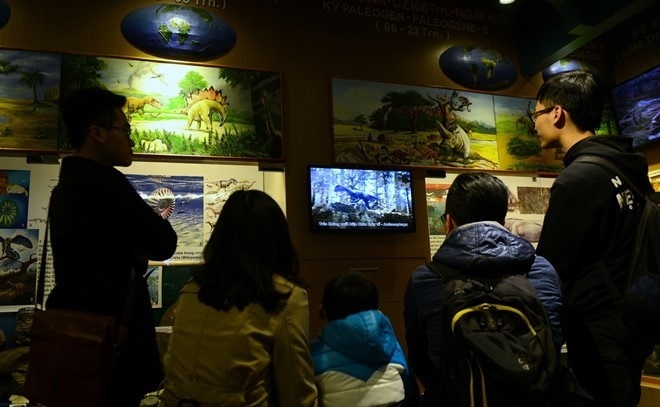 Each exhibition area has a slide show, presenting to visitors about the evolution, development of flora and fauna at that period. 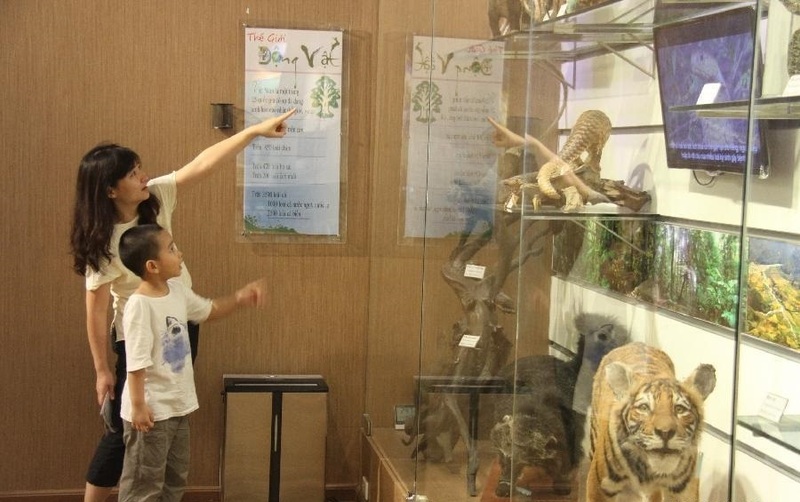 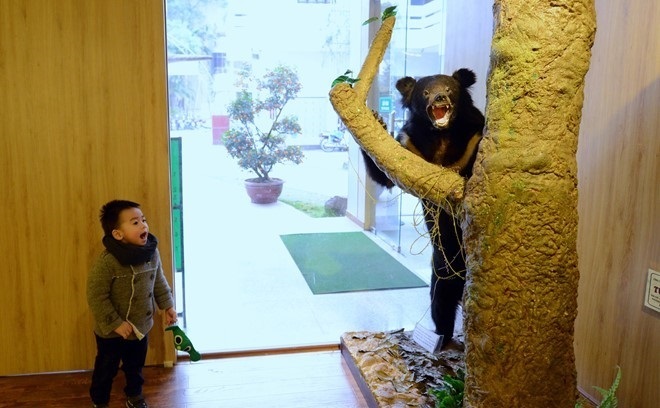 Young children get excited with the Indochinese bear specimens. 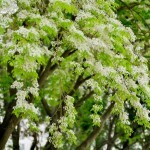 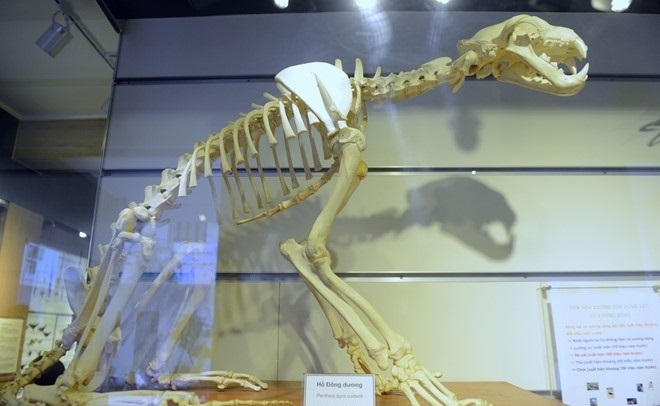 Vertebrate animal started their evolution about 530 million years ago. 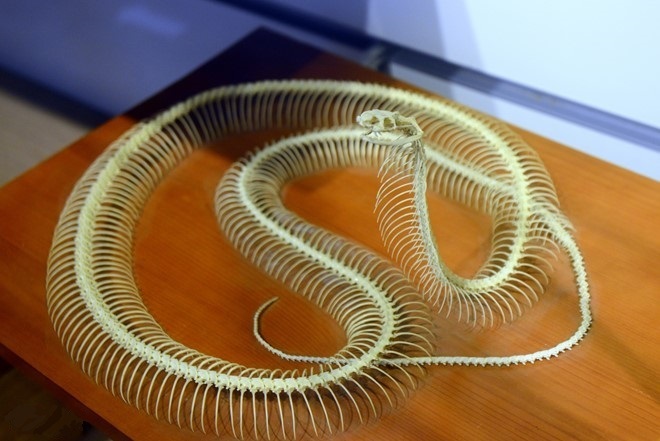 In the picture are the bones of an Indochinese tiger collected at Hanoi zoo. 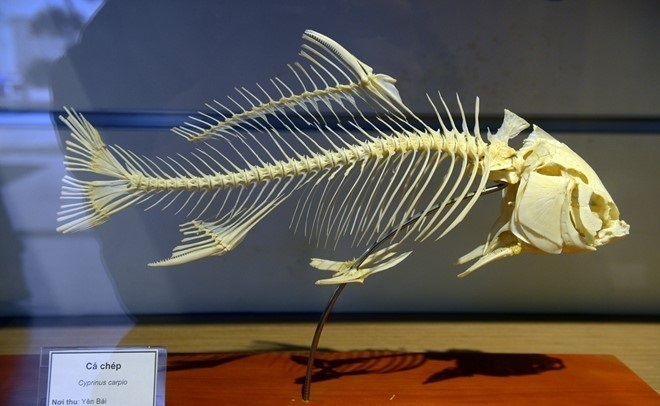 Quite complete skeleton of a carp. 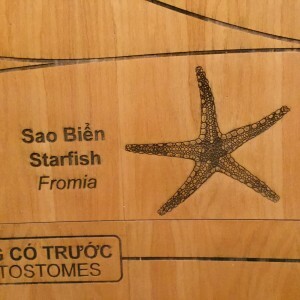 A template of pointy-tailed moon fish. 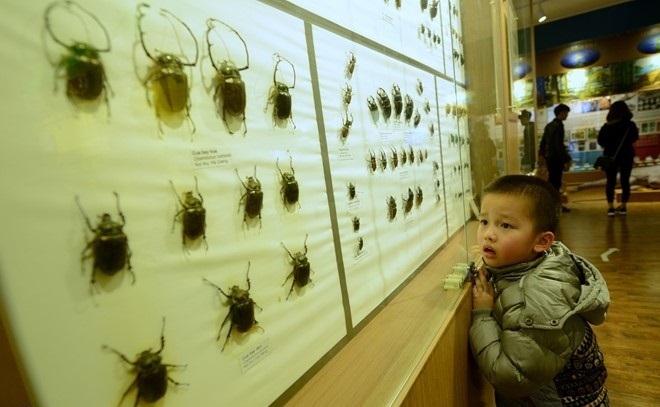 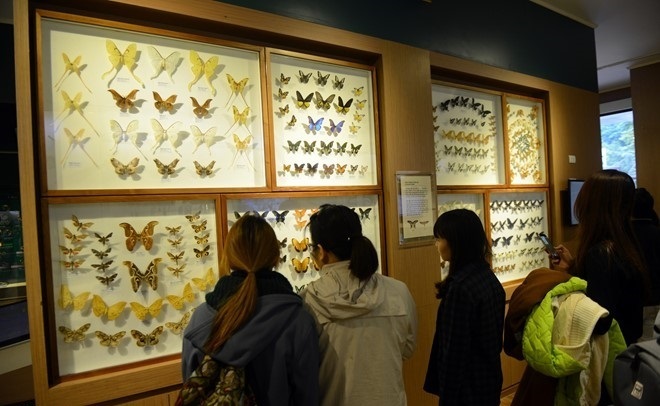 Coleopteran exhibit space is the most favorite area to many young kids in the museum. 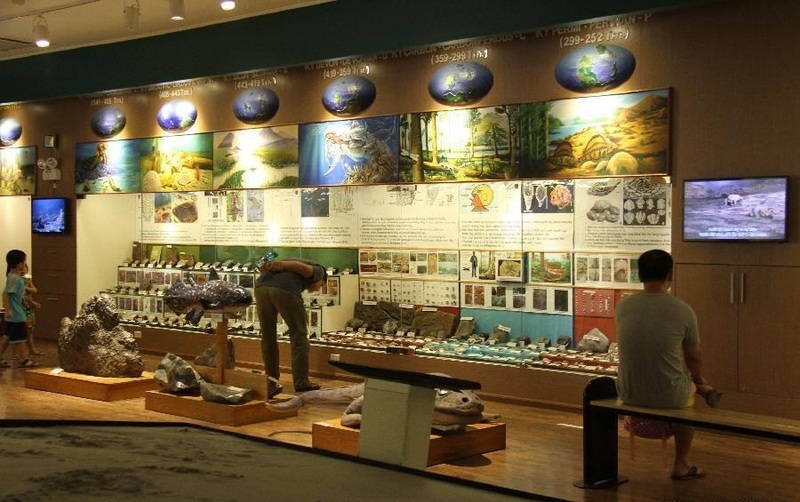 Exhibit space for plant and fungi. 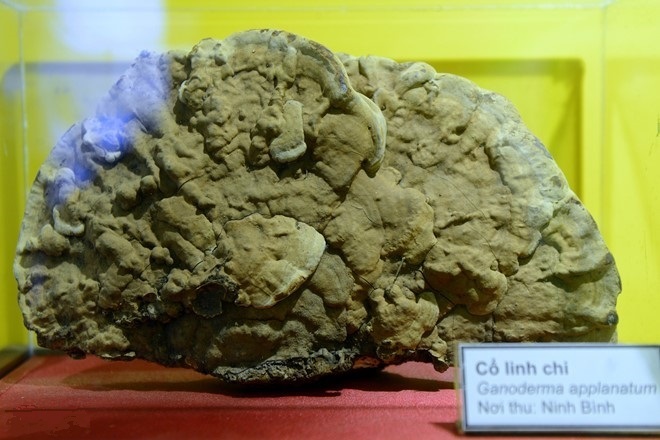 An ancient specimen of Ganoderma from Ninh Binh. 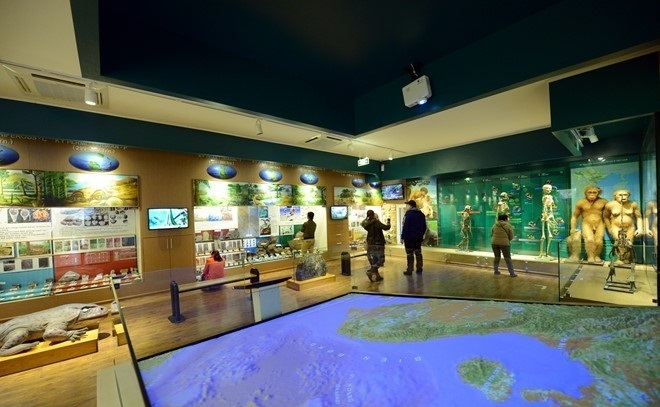 The museum opens from Thursday to Sunday every week. 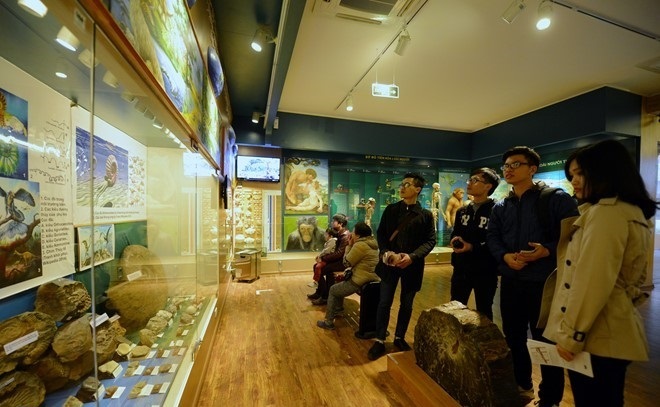 Tuesday and Wednesday are reserved for the groups which have preregistered. The museum welcomes about 200 to 500 visitors per day, depending on different days. 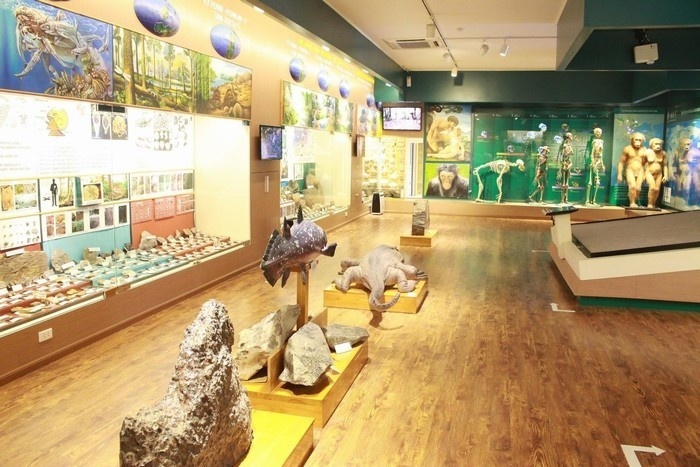 The opening time is from 08:00 AM to 11:30 AM and from 01:30 PM to 04:30 PM, free ticket price. 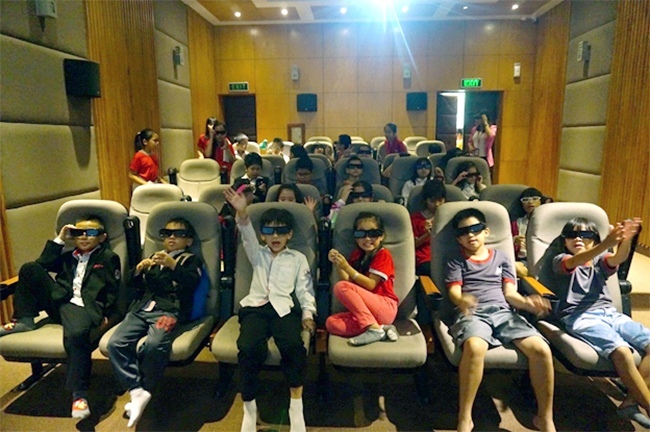 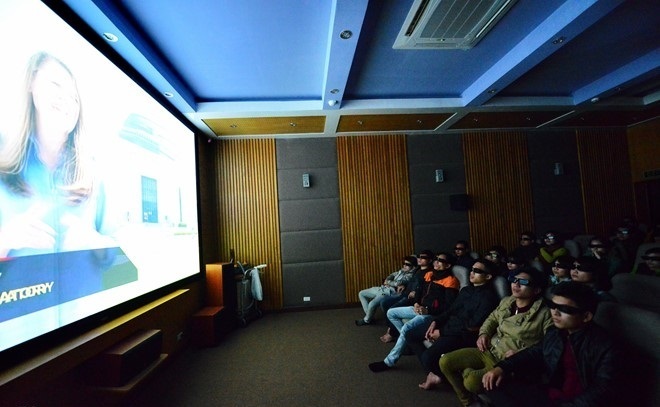 3D movie theater has 4 shifts a day with science films about space, marine, dinosaur, insect, fish and human evolution. Each shift only begins when there are 15 visitors or more and they have to register with the museum.